In Taiwan, it is obviously possible to start a quadrocopter. However, the legislator is also active in Taiwan and is working on new rules. These are probably primarily intended for commercial drones weighing more than 25 kilograms. It is unusual that legislation for privately used drones should be in the hands of regional governments. I am curious how this can be put into practice. Maximum flight altitude: At the moment, you can not climb higher than 120 meters with a copter. Maximum horizontal distance and FPV: No information found yet. Compulsory insurance: We recommend purchasing a drone insurance for operations in Taiwan. Maximum take-off weight (MTOW): 25 kilograms. Flight bans: There are several no-fly zones in Taiwan, which you can view online in this map. Alternatively, you can use the app “Sky Centry” to see which conditions apply at the current flight location. Flight approval: No information found. Regulations for commercial pilots: No information found. 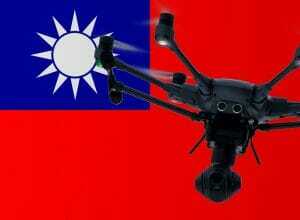 We have researched the listed drone regulations for Taiwan to the best of our knowledge. We can not guarantee the correctness of the information. If you want to be on the safe side, please contact the competent aviation authority. Alternatively, you can also ask the embassy in your country for further information about the regulations. Please leave us a comment when you receive news and/or gain experience with your copter in Taiwan! You can check this website which shows all prohibited drone area in Taiwan. We all follow this map to fly my drones. Hope it helps. In DJI GO should we turn the satellite settings to China? I am sorry, but I don’t understand your question. Any regulations bringing the drone into Taiwan? My drone is registered through FAA, but do I have to register it to any regulations that’s Taiwan specific?